During the fall months, Harrisburg becomes an especially great place for seniors to live. The weather has cooled, the leaves have become more vibrant, and there are quite a few unique events taking place. Whether your elderly loved one wants a taste of local history or just wants some entertainment or socialization, there’s likely to be an event this autumn to suit his or her interests. Harrisburg, PA, at-home care professionals suggest 4 possibilities. Not many residents of Harrisburg realize just how important their region was during the American Civil War. In addition to battles being fought in Harrisburg, a number of key clashes took place in nearby Carlisle. On Oct 1st, the Cumberland County Historical Society is offering walking tours of Carlisle led by local history enthusiasts. These tours are done at a reasonable and enjoyable pace so Harrisburg residents of all ages can enjoy learning some local history. Everyone has likely heard about the legend of Ichabod Crane and the Headless Horseman’s reign of terror in Sleepy Hollow. Starting on Oct 12th, the Popcorn Hat Players will be conducting a weekly play of this extraordinary American tale at the Gamut Classic Theater. Your loved one only needs to pay $8 to see a live version of this Halloween tale that has captured the imagination of history buffs and theater fans throughout the country. This tour is a great option if your loved one would like to learn more about Harrisburg but isn’t able to take longer walks or hikes. On October 13th, Janet Taylor leads this tour through some of the most spectacular bridges and cemeteries in the area, and there is a chance to take pictures at each stop. Immediately following the presentation, tourists are taken to JD’Z Station House Restaurant in nearby Loysville for a diner-style meal. Due to limited seating, those who are planning on taking this tour should sign up as early as possible. If your loved one is part of the LGBT community, this monthly event is a great way to make some new friends. Aging with Pride is a friendly organization that works with senior members of the LGBT community who are looking to meet like-minded individuals. Throughout the fall and winter months, Aging with Pride meets at The Center for a brown bag lunch followed by a leisurely walk through Broad Street Market. These meetings are completely free to all senior residents of Harrisburg and the surrounding communities. 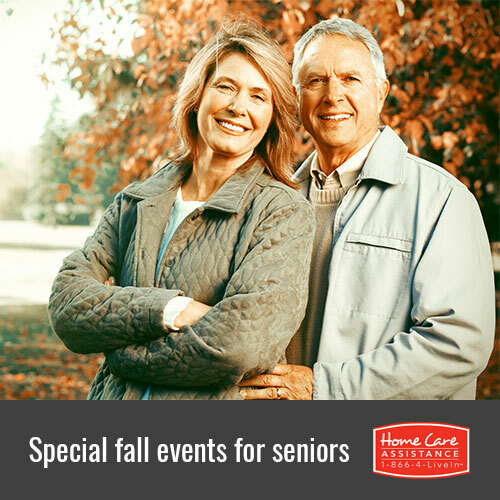 If your loved one needs transportation or a trusted social companion to attend these or other events, turn to Home Care Assistance. We are a leading provider of respite and 24-hour care, and we also offer Parkinson’s, stroke, and Alzheimer’s care Harrisburg, PA, seniors can count on. For more information, call one of our friendly Care Managers today at (717) 540-4663.